QuickBooks. What better tool is there for small or mid-size business accounting? As a savvy construction business owner, we don’t need to tell you just how indispensable QuickBooks can become to your everyday operations. Of course, even QuickBooks can’t do it all. When it comes to scheduling and dispatching, the program could use some help. Enter Smart Service, the construction scheduling software for QuickBooks. Smart Service expands QuickBooks to include scheduling, invoicing, customer management, project management, and more. Give yourself an edge over the competition! The QuickBooks add-on Smart Service works with your existing customer data, making scheduling a breeze right off the bat. 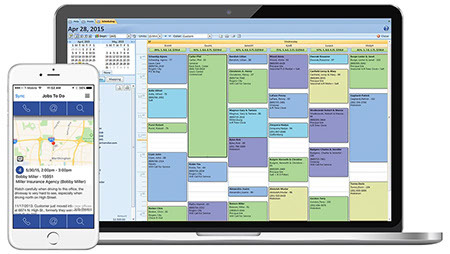 The easy-to-use scheduler empowers you to arrange work in the way that works best for your company. The intuitive interface shows you all the work for all of your crews in a single day on a single screen. From there, you can make any adjustments you need and assign new work without missing a beat. Once you schedule a job, it becomes a part of your customer records in QuickBooks. This construction software keeps everything you need in one convenient system! One of the coolest Smart Service features? The mobile app. The Smart Service mobile app makes communication and coordination between office and field staff incredibly convenient. Dispatchers schedule work in the office, then send the associated work orders to each field worker’s phone or tablet in the field. (Check out some recommendations on tough phones for the construction industry.) With all the requisite information available at the touch of a button, field work becomes much, much easier. Give your team the tools they need to launch your company into the stratosphere. Smart Service construction software for QuickBooks boasts the versatility to work for almost every imaginable construction specialization. Current customers include those in the contractor, remodeling, drywall, crane services, septic, road, roofing, and flooring fields, to name but a few. The customizability of Smart Service allows construction businesses to schedule work, manage customers, and manage projects with greater ease than ever before. All of the work performed in Smart Service and the associated mobile app gets duplicated in QuickBooks, allowing you to run your company from a single convenient system. Start with Smart Service today! Launch your company to the moon with construction software. Request a demo! Increase your construction knowledge base!